With our position as the regional online business in Southeast Asia, our goal is to be the leader in digital services and platform for customers and businesses. Through our affiliated businesses and operating brands, we build eco-systems that contributes to greater value for the betterment of our customers and businesses. Ascend Money: Regional fintech company in Southeast Asia offering innovative financial services to better the underserved and digital consumers’ lives. e-procurement solutions, office supplies, travel services, fulfillment, and digital marketing service. Cloud and data center provider that meets the needs of enterprises, medium-sized firms, and government agencies to help enable and support Thailand’s digital economy. Ascend Commerce company signed a Memorandum of Understanding (MOU) with the Department of Community Development for the OTOP e-commerce project. This collaboration will help to promote Thai products via the WeLoveShopping.com website - helping entrepreneurs to connect with customers to grow new business opportunities. .
TrueMoney, operated by Ascend Money company, reached 50,000 agents throughout 5 countries in 2017, which includes Cambodia, Indonesia, Vietnam, Myanmar, and the Philippines. Ascend Money is the only fintech company with license to provide e-money financial services across the region. Mobile phone users can easily donate money to ten charities through TrueMoney Wallet app. In the campaign, TrueMoney will add 10 Baht per account to each donation, and up to 100,000 Baht per charity. Various charities are included, such as those to help underprivileged people, and restoring natural environments. 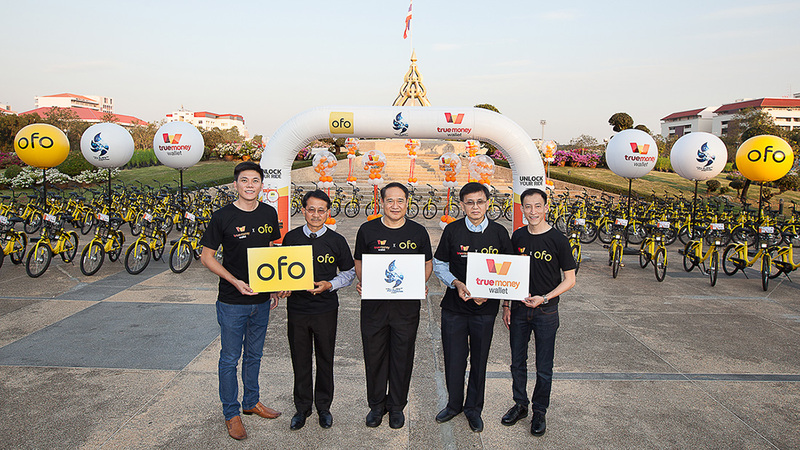 TrueMoney Wallet, Thailand’s leading online payment platform, has collaborated with ofo, the world's leading “station-free” bike-sharing platform to support the 45th Thanyaburi Games. ofo has been providing staffs and students with smart bikes to travel around the university campus. TrueMoney and ofo have provided free services, plus offering incentives for users with the highest number of rides between January 22nd to 31st 2018.